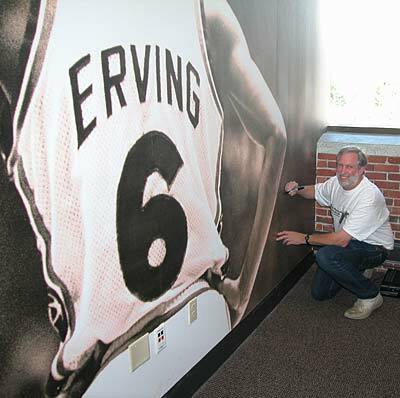 The Julius Erving Conference Room at Converse headquarters in North Andover Massachusetts. They reproduced my #138 photo 17'x13'. 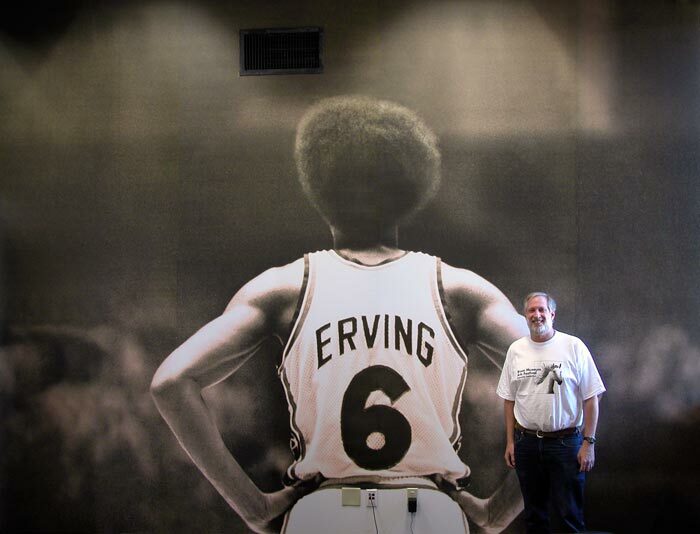 It might be the largest photo of Julius Erving ever printed. To make this extremely large 17'x13' four section photograph, I scanned a black and white 8x10 print at the optical resolution of my flatbed Epson 1640SU scanner which produced a 165 megabyte file. 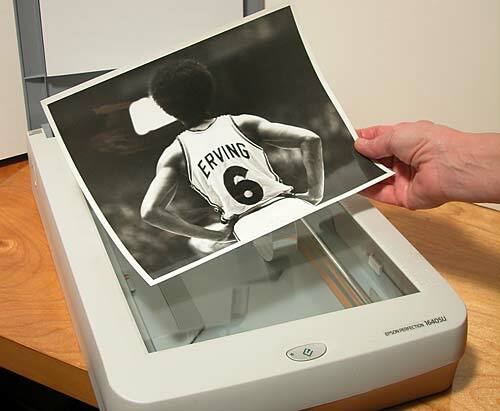 John MacNamara of Advanced Photographics used Photoshop to eliminate the strong white light from the sign behind Julius Erving's head and added information to the top and sides to make the image proportion fit the wall. He then used Genuine Fractals to increase the file size to approximately 700 megabytes and printed it in four 56" sections with a Vutek 2360 Solvent Printer onto vinyl wallpaper. An opportunity for both Converse and for me. They invited me to sign my photo. Both photographs were taken by Mary Berman. We set the tripod up on top of a conference table and she stood on the table to shoot the picture with my CoolPix 5000 set at 28mm.